If you are newly engaged and are just starting to consider shopping for your wedding dress you could well be thinking, well what exactly is a Trunk Show? Well, a Trunk Show is s a special event at which the wedding dress designer (or a representative from their team or company) visits the Bridal Boutique on a set day with their full line of new or latest dresses. The bride schedules an appointment to try on the dresses and meets with the designer or a representative. So, now you know all about Trunk Shows, we are absolutely delighted to tell you about a collaboration with one of popular designers – Alma Novia. The fabulous brand from Barcelona. 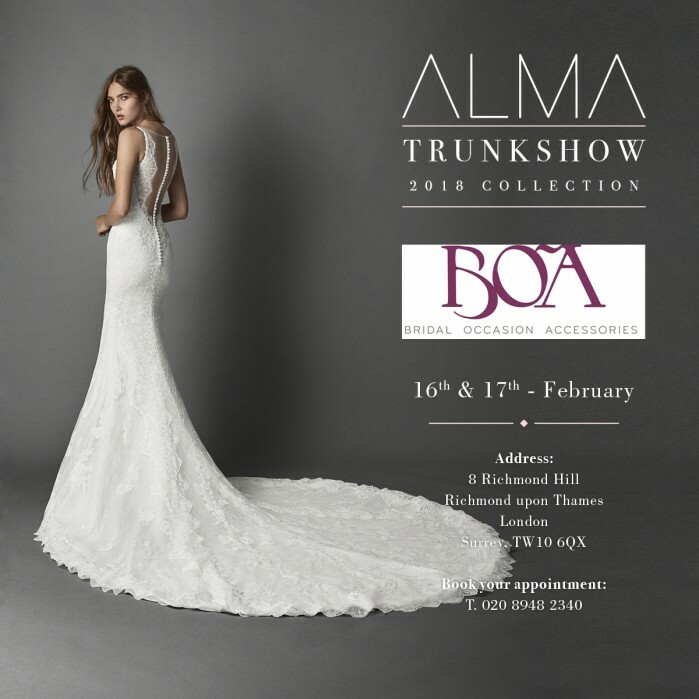 The trunk shows will be happening on February 16th through to Sunday 18th at our Richmond Hill Boutique, and it’s a fabulous chance to try on the very latest designs from this fantastic design house. Please call us on 0208 948 2340 or email us through our website at your earliest convenience to schedule an appointment for this exciting event.